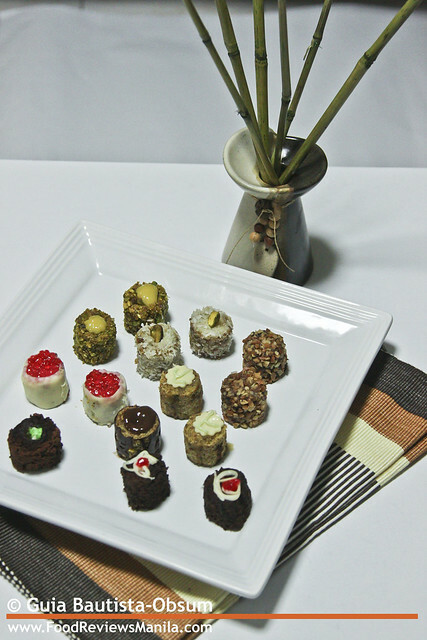 Kashi Makis -- charming, little desserts formed to resemble maki or sushi rolls. A couple of months ago, I had my first encounter with these eye-catching, sweet rolls. Actually it was more like a teaser. Let me explain. You see, I love sashimi and sushi, my favorite of which is the rolled one or the Japanese maki; heck, I even love Korean maki or what they call kimbap. 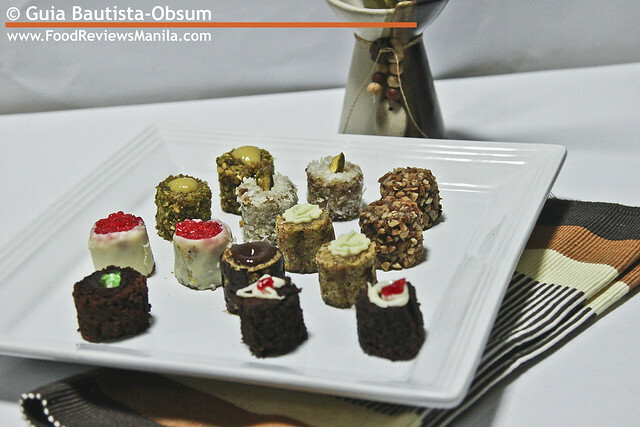 So imagine my delight and fascination when I heard about and saw these little maki-inspired desserts. How quaint... and how ingenious! 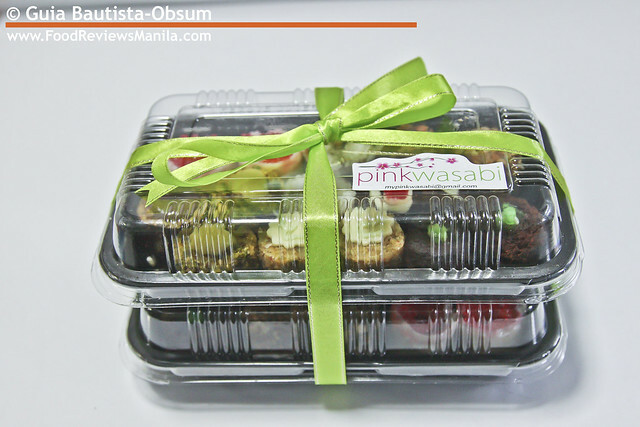 When I attended a food event that had My Pink Wasabi on their roster of food purveyors, I was excited -- excitement that was short-lived as I only got to nip on a tiny sample of Midnight Mint. That totally left me hankering for more of those intriguing pastries. Finally I had my chance. Whatever little delibation I've had on that initial experience, I more than made up for when I ordered two of the 15-pc party trays P770 (which I got for half the price, thanks to eBay's Kuponan deals). I started my gastronomic episode with the Oolong Berry. I bit into the soft, cylindrical white chocolate shell and was greeted with a white chocolate truffle enclosed in almond cake. The strawberry roe that lie on the crest attract and tantalize, easily making this one of my favorites. Next is a chocolate cake encrusted with toasted nuts, aptly named Choco Loco. Its center is a mixture of cashew nut paste and Belgian milk chocolate ganache, a treat for the avid nut and choco lover, though a bit too much for me. Gratefully, my next bite, Lemony P., cut through the choco nutty taste and provided a nice, clean tangy lemon flavor. I peer at the star-shaped lemon curd that sits atop this pistachio-enrobed cake, as I relish the echoing crunch of each pistachio nutty bite. I then gravitate towards the White Matcha with its white chocolate tablet roosted at the top of another pistachio cake that embraces a luscious white Belgian chocolate. My taste bud searches for the green tea but the nuts overwhelm my palate enough for me to miss out on its infused flavor. I pick up yet another pistachio cake, this time cocooned in a sheath of coconut flakes. Called Coconut Dream, the smooth coconut white chocolate ganache dances with the tongue, the flakes providing texture (albeit too much sometimes) as I protractedly nibble on the piece of pistachio at the crown. The Cookie Kiss is reminiscent of the Black Forest cake with cherries and Chantilly cream hidden in a capsule of chocolate cake. I failed to recognize the crushed cookies that supposedly enwraps this kashi maki as what I've come across is just a soft, fluffy dark chocolate sponge, though hey, I'm not complaining. A hardened web of chocolate encloses a pistachio sponge infused with amarula liquor and a hint of coffee; this new flavor baptized as Marula also has milk chocolate ganache for a heart. The liquor teases and the coffee soothes the palate, a reciprocity of flavors that is gladly welcome for an ardent liqueur-infused chocolate aficionado like me. Ahhh, my ultimate favorite, Midnight Mint. Imagine dark mint chocolate truffle (cue in the oohs! ), enshrouded in velvety soft chocolate cake and dusted with cocoa powder. Brown on brown on utterly luxurious brown. Then a few tiny green balls of mint roe perch at the pinnacle, tempting, calling out to my propensity for mint in chocolates. I allow it to seduce me before I finally revel in its sybaritic nature. 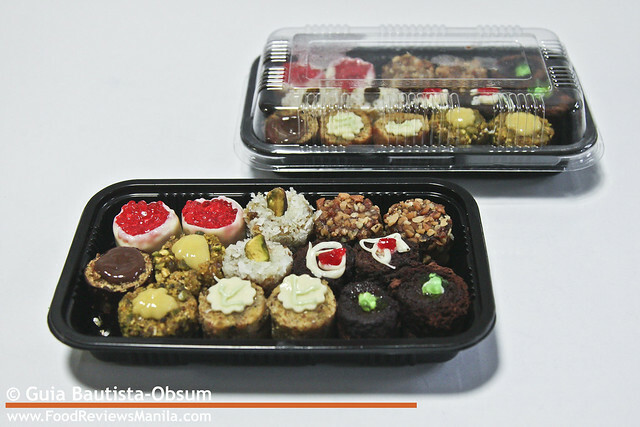 With the variety of flavors tinctured in these adorable Japanese-inspired treats, it would simply be hard not to find a favorite or two. Or three. lol i have to admit my brain spazed out when I saw those would be sushi rolls. That's quite an innovative look for cakes. ..wow i like the concept of your products..
..i want to buy it and give it to my parents.. I like all the presentation of the food.. It looks like super delicious.. thanks for sharing this info.. I wonder how you got so good. This is really a fascinating blog, lots of stuff that I can get into. One thing I just want to say is that your Blog is so perfect! keep posting! That was interesting.I like your quality that you put into your post.Please do continue with more like this. Great post, thank you for the efforts you have made in writing this article..Please Keep posting.. Wonderful! The presentation of the food are so fabulous and unique.. I really like it.. Thank you for the efforts and time that you spent in this article.. Keep posting! Great post! This Article are very helpful for us, Thank you for this informative article. Its is almost perfect! Continue posting. GodBless. Read a lot of blogs specially interesting ones like your blog, Good post!I accidently found your site on the internet, I am going to be coming back here yet again.Love Information Is Beautiful. Keep posting! I must say that your post is very interesting! I Like your blog ! Thanks for sharing this informative article.. It was nice to know this blog.. Keep it up the good work.. More powers to your blog..